I'll work for you Christmas. I'll work for you Sunday. I'll work overtime everyday. But I won't work on Mardi Gras. That's my day. I don't know what I ain't did in my life. I done work so much, girl. I done plant cane, I done hoe cane, and I done cut cane. I done work at Celotex. Ma daddy had me plowing for him to plant corn and cane. I done been an overseer, sat on a horse from seven in the morning to four--in the field--I can cook and wash, and iron. Let me tell y'all one thing. Work don't kill nobody. If it had to kill, it would kill me. And at that, I was sewing for out. I'd take my sewing around nine o'clock and I'd sew till two o'clock in the morning. Then I'd go to bed, and get up in the morning to go to work. The worlds of work and play are two realms where adults participate actively, yet often unconsciously, in traditional learning and teaching in daily life. Children are not alone in their love of play, for grown-ups also love play and even find ways to incorporate it into their work lives. Nor are adults alone in having to work; children must go to school and also construct meaning and knowledge in informal, traditional learning experiences. 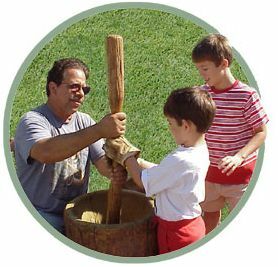 Participating in, learning from, and teaching the folklife of various folk groups in our lives help us create meaning and form values, as well as develop skills and knowledge. Sometimes we are working without realizing it by learning in traditional settings and manners. Other times we are incorporating fun into work, consciously or unconsciously enriching our occupational folklife. Have you ever seen a wreath made of plastic bags decorating the grill of a trash truck? Wondered about the gestures construction workers use to give directions over the din of giant machinery? Picked up a handy grading trick from a colleague? Occupational folklife offers intriguing opportunities for students to learn how people keep learning throughout their lives, to explore the traditional culture that exists in any type of workplace, and to know their communities and the regions of Louisiana more intimately. From complex skills taught on high-risk jobs to the decoration of private workspaces, tricks of a trade to insider professional jokes, occupations provide windows to learn more about people and places, teaching and learning. A high school or college diploma alone does not give us the skills or knowledge to manage a classroom, cap an oil well, or program a computer. We must learn from our colleagues, supervisors, and those we serve, and we must adjust to the unique folklife of each work setting. Work around the home is still work, so this unit also includes domestic work and crafts, which Unit VII examines as well. Consider linking activities in both units. Students will consider their own domestic responsibilities and skills as well as those of others in their families, the community, and the state today and in the past. Telling a funny story in the teachers' lounge, posting a cartoon by the copy machine, carving decoys, or joining a book group may not seem like play to a child, but adults weave play into their workaday worlds and their private lives. The climate, geography, and rich folklife of Louisiana create abundant arenas for lifelong play and recreation. In Unit III, students explored the play and games of childhood. In this unit they consider the ways that adults enjoy life and share community through hobbies, shared events, oral narrative, crafts, music, dance, and many other activities. Learn more about music and dance in Unit VI and about shared events such as rituals, festivals, and celebrations in Unit IX. The topics in this unit provide opportunities for embarking on intriguing fieldtrips and inviting an array of visitors from different occupations and crafts genres into your classroom. Perhaps a residency could be arranged so that students could learn a skill or craft directly. As with the other units in this guide, the lessons may be used to study regions, material culture, music and dance, oral narrative, and the seasonal round. Literature, writing, reading, math, science, the arts, and social studies relate to all jobs, so consider integrating interdisciplinary connections into this as well as the other units. Explore Unit II which augments this unit, and in particular Lesson 3 about inviting a community guest into the classroom.